A heart rate monitor to bring a higher degree of accuracy to your daily calculations. However this pule monitoring will require you to pinch the band, so it won’t deliver continuous monitoring like a true heart rate monitor. I presume that this data will be made available within your Nike+ profile, but that remains to be seen. Finally, a more robust developers API which opens up the enticing possibility that the social fitness craze can be carried by this upgrade. All of this comes on top of the already strong USPs of the Fuelband. The device was Nike’s first proper foray into the fitness technology market, and it has been a solid success thus far. It has become renowned for being easy to use and wear whilst providing some solid health incentives. 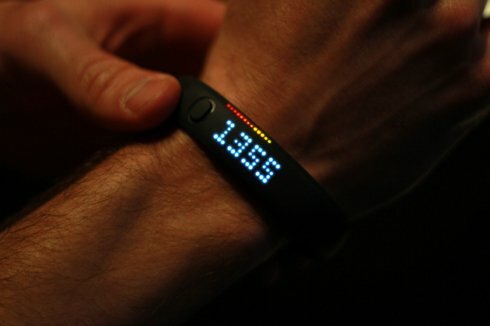 The premise behind the device, for those who are unfamiliar, is that activity is traded for Nike fuel points. You earn fuel by being active, which can range all the way from taking the stairs more often through to playing competitive sport. Calorie counters will notice the similarities, as you set a fuel points daily target and have to work to hit it. 2,000 fuel points is considered an easily achievable goal, with 30 minutes of moderate exercise being enough to work off around a third of that goal. Where the device comes into its own is with the element of competition that it invokes amongst friends. 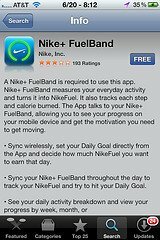 The Fuelband played a big part in the emergence of social fitness, which is a craze that has continued with the range of apps which have followed it. For that reason, I am especially excited by the prospect of an enhanced developer API, as this could really help push the social fitness craze to the next level. The Fuelband has enjoyed consistent press coverage, and has its celebrity supporters, including Tim Cook (Apple CEO). As of yet, we have no timeline on the possible release date for the new Fuelband, but I don’t expect it to be long considering the wealth of new technology being released by Fitbit at the moment. As always, we’ll keep you posted.